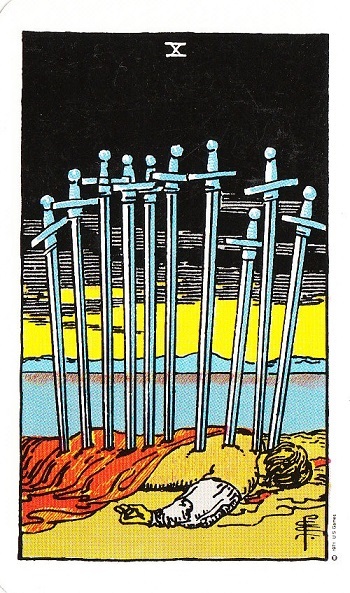 In the Ten of Swords, we see a man with ten Swords in his back. The night has passed and a new day is starting in the background. This is the end of the Swords suit in the Minor Arcana, we might now be ready to try a new approach to deal with our challenges. The Swords have run their course, now it is time to make room for another suit. Today all thoughts have ended, and a new day is dawning. You might have a sense that “you are over it” - what makes you feel like this? Why are you in this situation? Maybe you need to get rid of all the pressure - pamper yourself; if possible go and get a massage; relax! As with the previous cards we can see that the Swords are somewhat negative in their initial interpretation. The ten’s in the Minor Arcana show that there is an end of a cycle and we now have the space to move onto something else, something that might work better or shows us totally different ways of dealing with lives challenges other that the analytical way. Being a very driven person I do visit this card regularly for me it indicates that it is time to stop, smell the roses and be kind to myself, rest and relax a little bit. So unlike the ‘main’ interpretation for me drawing this card is often a very positive reminder that life cannot only be lived through the intellect and to-do lists. In the Crowley this card shows nine Swords and one Swords that is being shared the mind has reached its potential we are at the end of a cycle. In the Osho Zen deck this card shows a transformation through different states of being and indicates that you are in a time of change. Note: Especially with the Air element in the Tarot which is represented as a Sword card in the Rider Waite deck, there is a lot of ‘argument’ and there are several different ideas about weather Swords should represent Air and what else could be used. This leads us into a fairly advanced Tarot conversation - at this stage remember that Swords in the Rider Waite deck does not necessarily mean swords in another deck. 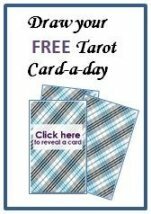 Tarot creators could have changed Swords with Wands or replaced Swords with rainbows or crystals to name a few. 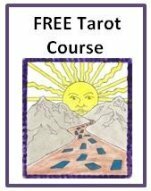 This is not wrong or right it is another way of thinking about the different elements used in the Minor Arcana of the Tarot cards. If you have multiple decks, it might be interesting to have a look at how the Swords are represented.